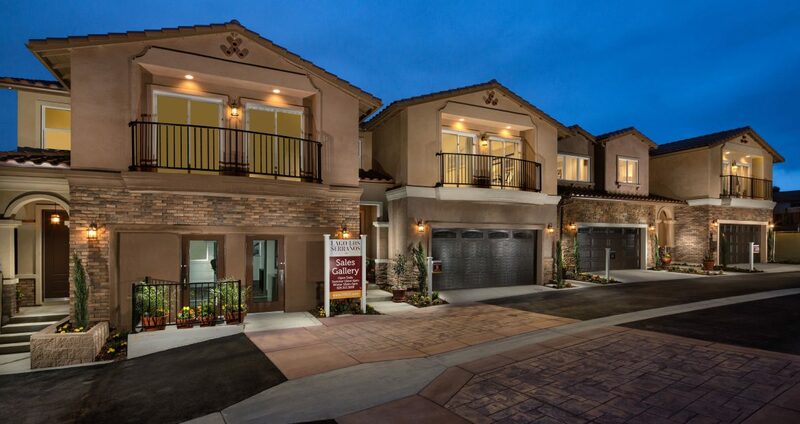 APRIL 2018 (CHINO HILLS, CA) Lago Los Serranos presented by JTECC, the newest community of townhomes in Chino Hills, has Grand Opened with overwhelming sales success; in just four weeks of sales, 18 of the first 23 homes released are already sold and the interest list for Sales Release 5 is now forming. Pricing starts in the mid $500,000s and the two-story homes range from 1,590 to 1,830 square feet, all with 3 bedrooms, 2.5 bathrooms, and a direct-access two-car garage. Spacious private rear yards average 450 square feet and the homes are located near highly-rated area schools. Thoughtfully designed and complete with exceptional finishes, the home interiors feature hand-laid designer-selected tile floors in the entry, kitchen and all baths, plush carpeting, quartz countertops throughout the home, shaker-style wood cabinets and a stainless steel GE appliance package. With several choices of available finish packages, Lago Los Serranos makes it easy for buyers to create a space that is comfortable, personal and uniquely theirs. Lago Los Serranos residents will enjoy access to the private community swimming pool and spa as well as basketball and tennis courts and passive open space. The onsite clubhouse includes a meal-prep and dining area, private meeting room, gaming tables, and lounge space. Lago Los Serranos is conveniently located less than 3 miles from a variety of dining, shopping, and entertainment options, including The Commons at Chino Hills, The Shoppes at Chino Hills, Chino Spectrum Towne Center, and the 99 Ranch Market and Costco Centers. For those that enjoy outdoor activities, nearby picturesque Chino Hills State Park and Prado Regional Park offer thousands of acres of open space, including large, grassy areas for picnicking, sports facilities, campsites, a golf course, a lake and an expansive trail network. Lago Los Serranos was developed and built by JTECC Investment. JTECC is a diversified and vertically integrated real estate firm focused on building quality residential communities. Headquartered in Orange County, California, JTECC is actively acquiring and developing real estate throughout the state. The company aims to create lasting value for its clients and partners by executing its unique vision on every project through a carefully-crafted development of repositioning program. Homebuyers seeking additional information are encouraged to join the Lago Los Serranos VIP interest list at JTECC.com or call: (626) 313-3688 to speak to a member of the sales team. Brokers welcome.